Let me start off by saying this game is completely crazy. December did not turn out how any of us thought it would. When we started the month our journal entry reminded us that our supplies were almost gone and that we needed to reach Lake Baikal to find the PEARL Lab. Once we get there we would get whatever cure they had and bring it to Johannesburg. We made it to Lake Baikal within the first round of the game and what we found out was really unexpected. The cure was here but it would be too dangerous to carry it out in the open so we had to inject massive amounts of it and carry it in our bodies. This dosage would kill the carrier. We only have 4 doses. In order to win this game we would have to kill characters. Our goal now was to build a supply center in Johannesburg and Self-Infect at the PEARL Lab in Lake Baikal. To self-infect we had to scratch off exposures until we found a scar or died. If we found a scar we had to add the carrier sticker to our character card. This carrier sticker would cover character abilities and once your a carrier life gets even harder. As a carrier you can only move by doing the drive or ferry action and once you enter a city you have to discard a card matching its color. Finally, once the game is over, win or lose, the character is destroyed! 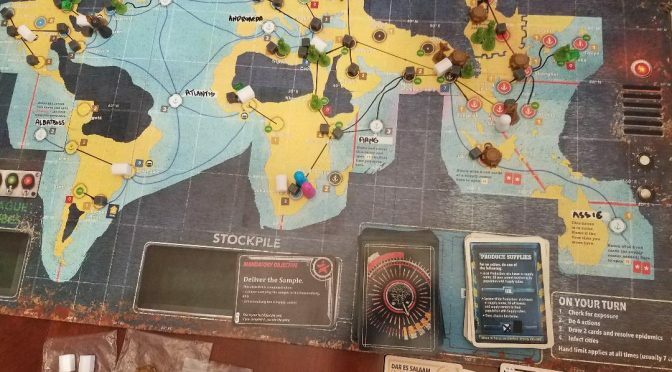 We realized it would be impossible to win this game because we didn’t have the cards in order for a carrier to move to Johannesburg and our plague cubes were out of control. We decided it wouldn’t be worth it to infect anyone, but to work on a building a couple of new routes to make it easier and build a satellite tower we could keep. We were able to accomplish this but this next game just seems impossible. It also just feels awful that this is the way its ending. None of us expected that we would have to kill off characters to win. Yeah, it’s the last month, but still, they couldn’t find a more satisfying way to end the game? During our second game in December we actually managed to pull off a win. I have no idea how this happened but we did it! Somehow we were able to manage plague cubes, build the supply center in Johannesburg and successfully deliver the sample. Claire, being the Laborer and Architect, was able to make the supply center in Johannesburg early on. She did receive her first scar of the game in the process but it had to be done. The scar she chose was called “weak”. This scar meant that Claire could only hold 3 supply cubes on her character card and that seemed ok because we didn’t see a need for carrying cubes anymore. Aofie was the character we decided should self-inflect because she had room on her character card to carry the scars. Also her most useful job as an Administrator would not be helpful in moving the carrier. We were able to build a broadcast station in the red area to give her cards. Once she had the majority of the cards she self-inflicted. The game couldn’t have been won without Goods. He was essential in managing stockpiles in cities. His Courier action which allowed him to deliver supplies to an adjacent city was huge. Goods was also a Smuggler which helped us out a few times because he could discard a card to move a supply cube from the reserve to the city that was discarded. Once Aofie was infected and had moved herself towards Newt he was able to move her on his turn all of the way to Johannesburg. He did this because he was a Coordinator and as a free action he could move a pawn to his location if they were in an adjacent location. We thought this was the only way a special ability could move the carrier because it was still a drive/ferry and Aofie had all of the cards necessary to discard to enter the city. After winning we were able to draw the final legacy cards. We thought they were a bit anticlimactic. I don’t know what we really expected but it just seemed like after spending a year on this game the whole ending was not what we expected. We learned that the world now belonged to the Faded and non-Faded. We tallied up our score and got 719. With this score we found that we had persevered and saved some cities. There are hopes that the Faded, non-Faded, and Hollow Men can co-exist. Even though we felt the first season was better we are anxiously awaiting season 3.